As an old sayings go "Shoot for the Moon." or "Tis better to aim high and miss then aim low and hit. ", the common human trait is that of the desire to aim high whether it be career or just simply life itself because of our constant belief that things will get better that tomorrow will be a better day. No matter how much time has gone by even if the settings changed desire never will. 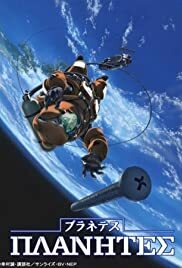 This is a criminally underrated and overlooked anime gem that is one of my personal favorite animes but also one of my favorite tomorrows world sci-fi's. This shows is similar in vein to Arthur C. Clarke sci-fi, it shows a believable world of tomorrow that looks possible and plausible. The rich mix of both 3-D computer animation and the usual but sophisticated Japanese anime which makes all the characters and settings look almost real. The music is superb it's a calm orchestra tone to make the scenes in space almost feel like an opera or even fit what the characters are going through. We see how advanced civilization has got but also see how beaten up and exhausted it has became on itself. We witness how despite certain advancements in science they've also paid a severe price by becoming careless in how they treat their enviorment in space. Even the politics involved have put too many barriers on sometimes the smallest things. Nothing always works right, even some of the spaceships some people have look like their days are nu8mbered. There is also a sense of boredom and how space travel has became reduced to nothing but an everyday commodity taken for granted instead of a frontier of endless possibilities. However its really the characters in the show and the drama involved which make the show truly work. Mainly the duo dynamic between Hachimake and Ai Tanabe whom are another of my favorite anime couples. Hachimaki I think is awesome, he's young, brash, unsmooth, a loner, rebellious where he doesn't just break the rules but he bends and breaks them, and obeys the rules he writes in his book. He's also borderline selfless and selfish, but has a strong ambition of traveling out into space and exploring the untouched frontier. He's also an underdog as he is kinda a blue collar worker struggling to make his dream come true but also some thing that happened in his past which made me respect him even more and angry at those that have abandoned or shunned him for no good reason. Ai Tanabe is also young, pretty, naive, brave, selfless which can make her never very realistic when it comes to certain matters however that turns out to be a strength that Hachimaki very much needs. Both of them have a slightly shaky but close friendship,they both agree or disagree with one another and but both do have one thing in common and that is they deeply love each other as more than just friends whether they know it or not. We feel pathos for both of them from what they go though and their feelings for each other evolve but so does their career. In a strange way the career their in starts to look bigger and more important; the Debris Haulers aren't janitors in space but are like Firefighters or Emergency Workers doing the best they can to make space safe fore everyone. Indeed it really is the Debris career that matters the most, and personally I think it's a cool job, getting to go out into space and working with lots of technical equipment. Even though the careers below are considered the higher up careers, they start to look smaller and not as important; those careers are a little lame in my book what the heck else do they even do other than just monitor. The show has ethical themes like enviormental ethics and why science and human politics must learn to act responsibly for human progress. But also deep post modern philosophy on heroism, ambition, love, man's place in the universe, and how much more a person can be. The universe is vast and big, enough room for dreams and love.